of an Anglo-American woman. As a type ofthese dwellings can he found everywhere within our new settlements upon the frontier, nodrawing is deemed necessary to give an idea of their appearance. In the Itinerary may hefound a description of some that were visited. Beaverstown consists of a range of log houses, huilt hy troops, at old Camp Arbuckle, for tem-porary quarters. When deserted hy the soldiers, a band of Delawares took possession ; althoughthe structures are inferior to those erected hy the Choctaws and Shawnees in their respectiveArillages. 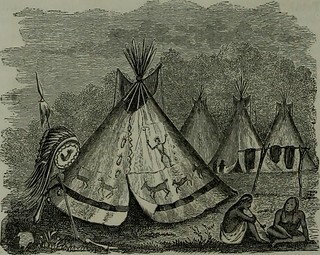 Plate 4 represents a Kaiowa camp in the valley of the Canadian. The tents are formedwith light poles twelve feet in length, interlaced and tied near the top, and thence spreading soas to intersect the ground in a circle. Over these are spread coverings made of nicely dressedbuffalo hides, the hair side being turned inward, and the exterior fancifully painted. The topmay be opened to give egress to smoke, or closed to exclude rain. Ilate 4-. Kaiowa camp. 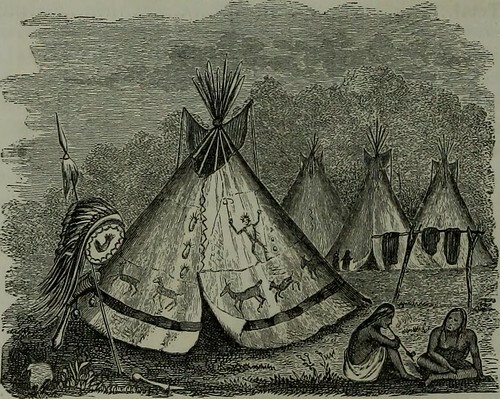 Plate 5 shows their method of packing the tents in changing the position of camp. Thepoles are fastened to the sides of a horse, and allowed to drag upon the ground. Comanchesare said to make use of similar tents, except when hunting or at war. The camp which we NOMADIC INDIANS.—PUEBLEROS. 21 saw upon Shady creek was composed of artificial bowers, formed with bent saplings and leafy-twigs. There were hundreds of them of the same construction, evidently intended for merelytemporary use. Plate 5.